he 194th Glider Infantry Regiment (GIR) was constituted on 16 December 1942 in the Army of the United States. It was activated 15 April 1943 at Camp Mackall, North Carolina under the command of Colonel James R Pierce (picture left) who graduated West Point in 1922 along with General Maxwell Taylor, the commander of the 101st Airborne Division. The 194th GIR was immediately assigned to the 17th Airborne Division. Moved to the Tennessee Maneuver Area 7 February 1944 then transferred to Camp Forrest, Tennessee 24 March 1944. Staged at Camp Myles Standish, Massachusetts 14 August 1944. Departed the Boston Port of Embarkation 20 August 1944 and arrived in England on 28 August 1944. When the 194th GIR arrived in England, the regiment was immediately shuttled to Camp Chisledon, the 17th Airborne Division staging area, on August 28, 1944. Flight and tactical training continued and night maneuvers were added to the training schedule. When Operation Market Garden was initiated, the 17th Airborne Division was still in training and was held in strategic reserve. Suddenly, on December 16, 1944, the Germans launched a surprise offensive through the Ardennes Forest which caught the Allies completely by surprise. The 17th was still in England. But the 82nd and 101st Airborne Divisons were in Sissones, France and were rushed by truck to contain the bulge in the Allied lines. Between December 17 and 23, the Germans were halted near St. Vith by the 82nd Airborne and Bastogne by a roadblock, defended by the U.S. 7th Armoured Division and the 101st Airborne Division. To help reinforce the siege at Bastogne the entire 17th Airborne Division was finally committed to combat in the European Theater of Operations. From 23 to 25 December, elements of the Division were flown to the Reims area in France in spectacular night flights then hastily trucked into Belgium. Meanwhile, Patton's Third U.S. Army had finally broken the siege at Bastogne with a marathon thrust from the south. 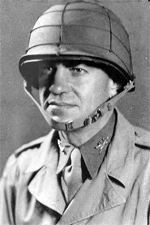 Upon arriving the 513th PIR and the other elements of the 17th Airborne Division were attached to Patton's Third U.S. Army and ordered to immediately close in at Mourmelon. After taking over the defense of the Meuse River sector from Givet to Verdun on 25 December, the 17th moved to Neufchateau, Belgium, then marched through the snow to Morhet, relieving the 28th Infantry Division on 3 January 1945 and establishing a Division Command Post. In the ensuing days, the 194th GIR would gain their baptism of fire that would have tested the mettle of the most experienced airborne units. General Patton had ordered the 17th Airborne to seize the town of Flamierge where the 11th Armour and the 87th Infantry Divisions had encountered brutal resistance from the Germans. The plan called for two regiments to push forward, the 513th PIR on the right while the 194th GIR under Col James R Pierce (with the 550th Glider Infantry Battalion attched) would be abreast of the 513th on the left. Almost immediately after the regiments jumped-off they encountered a relentless fusillade of mortars. The 194th was hit hard and along with the 17th Airborne's two glider regiments sustained heavy casualties but they galantly achieved their objectives. The 17th returned to camp at Chalons-sur-Marne in France on 11 February 1945 then back to Belgium on 21 March 1945 to prepare for the air assault across the Rhine. In early February 1945, the tide of battle was such as to enable an accurate estimate as to when and where the 2nd British Army would be ready to force a crossing of the Rhine River. It was determined that the crossing would be in conjunction with an airborne operation by XVIII Airborne Corps. The sector selected for the assault was in the vicinity of Wesel, just north of the Ruhr, on 24 March 1945. Operation Varsity would be the last full scale airborne drop of World War II and the assignment went to the British 6th Airborne Division and the 17th Airborne Division. This would be the last full scale airborne operation of the war and the first glider landing for the 194th GIR. The 194th's mission was to land north of Wesel in Landing Zone (LZ) S, a large flat area where the Issel River and the Issel Canal merge. Then to seize the crossing over the Issel and protect the division's right flank. As General Eisenhower watched the operation from a church tower on the west side of the Rhine the 194th had the misfortune of flying over a concentration of German antiaircraft weapons. Two-thirds of the C-47's were either damaged or in flames. The pilots remained with the aircrafts until they released the gliders which landed amid German Artillery units. The German gun crews immediately repositioned their guns for direct fire. It was a fluid situations for a period but the glider troops prevailed and were able to overrun the German positions. By mid-afternoon on 24 March 1945 the 194th had secured its objective including the destruction of 42 artillery pieces, ten tanks and the capture of 1,000 German prisoners. By 26 March FM Montgomery had sufficient forces on the German side of the river to move eastward. The next day, as the 194th advanced toward the town of Lembeck, the regiment was confronted with stiff German resistance. Company I attempted three frontal attacks but were repulsed each time with heavy casualties. It was during this fighting that Technical Sergeant (T/Sgt) Clinton M Hedrick (picture left) made a charge straight at the German positions while firing a Browning Automatic Rifle (BAR) from his hips. This inspired the remaining members of his company and they followed him overrunning the enemy positions. Some of German forces retreated into a castle with T/Sgt Hedrick's close behind. Then a German soldier lured Hendrick and his men into a trap by attempting to surrender. Hedrick sensed the trap but was immediately wounded. Although he was mortally wounded, he was able to signal his men to pull back while he single-handedly engaged the enemy forces. By the time that his BAR was silenced he had wiped-out the remaining German forces. Bleeding profusely Hedrick's died shortly after. For this heroic action T/Sgt Hedrick was posthumously awarded the Medal of Honor. During the ensuing weeks the 194th continued to push forward even capturing the Nazi diplomat and Hitler confidant, Franz von Papen, on his estate east of Essen. Shortly after this incident the regiment was attached to the 95th Infantry Division from 5-13 April 1945. The 194th GIR served in the Army of Occupation of Germany from 2 May - 14 August 1945. The regiment then went to Vittel, France on 15 August 1945. It returned to the United States via the Boston Port of Embarkation on 14 Sepember 1945 and inactivated at Camp Myles Standish, Massachusetts on the same date. 194th GIR - F Company - Photo of troopers from the 194th GIR - F Company at Camp Forrest, TN circa June 1944.